The chemistry and biochemistry program is pleased to offer the Bachelor of Science in Chemistry and a Bachelor of Science in Biochemistry. 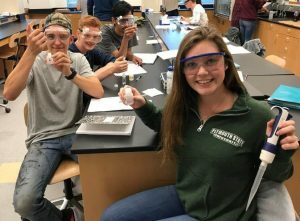 This chemistry program continues the proud tradition at PSU of rigorous academic preparation of students for a variety of career options. The program includes innovative activity-based learning in small classroom settings. Faculty teach all our lab classes, not graduate students. Chemistry lab sections range from 20 to approximately 10 students in upper level courses. 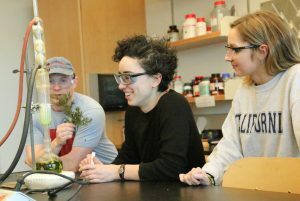 Integration of chemistry majors within the program provides opportunities for students to work closely with faculty and staff as teaching assistants, tutors, and laboratory preparers. The options in the Bachelor of Science degree provide opportunities for students to focus their interest in the areas of general or environmental chemistry. Both options include a senior research project under the direction of chemistry faculty. Majors can also now take advantage of the new 4+1 MBA program. This exciting program is housed in the Boyd Science Center which includes state-of-the-art laboratories and classrooms. A chemistry student center is available for tutoring and student interaction. Options available in General Chemistry and Environmental Chemistry.